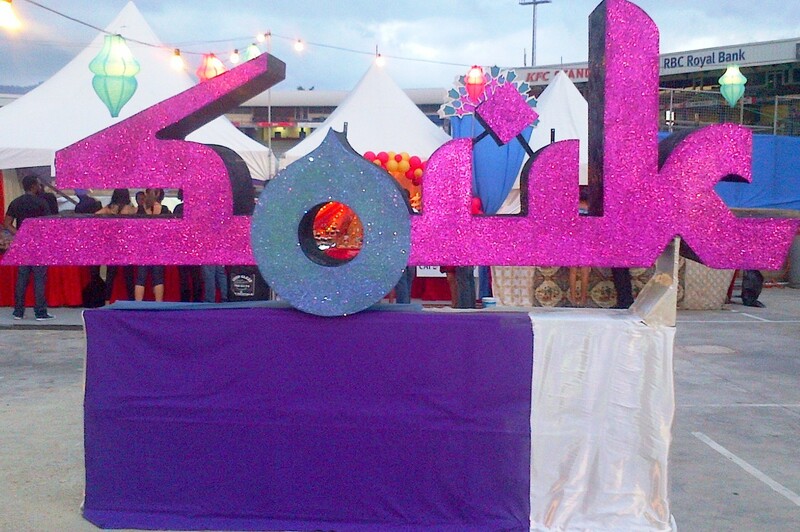 Did you make it to Souk – T&T Drinks Festival held on Saturday, November 3rd? The Souk buzz has been tremendous thanks to pre-event promos/mini-Souks, some serious Facebook and Twitter marketing and newspaper ads. So come Saturday night, we headed to Queen’s Park Oval to experience this Trini-style Souk, the first incarnation of the T&T Drinks Festival! Billed as “a celebration of beer, spirits and wine, plus so much more,” Souk thoroughly lived up to its tagline and all the pre-event hype. Festival patrons were treated to great food and top-shelf liquor brands and cocktail products, an elegant Wine Alley, glasses of different champagnes, and of course local beers at Carib’s Brewhouse and Stag Station. Live entertainers, DJs, belly dancers (and even a clown) were on hand to keep the crowd moving and occupied. Entrance: Upon entry to the T&T Drinks Festival, each guest received a pouch full of tokens (each token was worth $10), which was more than enough to sample every booth at least once (most booths priced their food and drinks between one and four tokens). Food & Drinks: Souk housed about 15 to 20 vendors, including four local restaurants/caterers — More Vino/More Sushi, Chef Boyz, Arabian Nights and Cafe le Bistro. For us, Chef Boyz and Cafe le Bistro really shined with their alcohol-infused dishes and sweet treats. Chef Boyz, a Valsayn-based catering company, really delivered with large portions of mouth-watering goodies — Tequila Shrimp Sicles, Bar-Beer-Que Chicken Skewers and Pulled Pork Sliders with a Johnnie Walker BBQ Sauce. (We loved that Chef Boyz shared the recipes for these appetisers on recipe cards, so you could recreate them at home). Keeping with the theme all-things alcohol, Cafe le Bistro, also of Valsayn in Grand Bazaar, offered up a wonderful mix of boozy cupcakes. We were over the moon for the decadent Cafe Patron Chocolate Cupcake and an Apple Vodka Red Velvet Cupcake, which both mimicked the drink flavours quite well. Angostura’s Mixing Academy was a must-see as professional mixologists taught the enthusiastic crowd how to make Saga Boy Mojitos (a decidedly Trini-spin on a classic that incorporated portugal juice) and Boston Cream Dreams (milk-based cocktails with Mokatika Coffee Liqueur). At the end of the demonstration, the drinks were given to thirsty audience members and we were lucky enough to snag a delicious Saga Boy Mojito. And, there were more freebies to be had! Drink! Wine Bar circulated fantastic sangria samples (no tokens required) and Jose Cuervo representatives roamed the festival grounds sharing free Cuervo Tequila shots with Souk patrons. Local beverage makers also got a festival nod with the participation of companies like Deckie’s Sorrel Liqueur with their sorrel and passion fruit wines, and Just Juiced, which was on hand with all-natural fruit juices for those looking for a juice-break. Summing it up, we had a fantastic time at the T&T Drinks Festival and hope it returns in 2013! home computers, or sending what they wish to have printed to a proxy, such as Fed – Ex.